October has been fairly light in terms of travel but duty called. This time the duties as a hockey mom which involved going with my son and his team to the city of Kitchener for a hockey tournament. Originally this was supposed to be a 3 day trip but cut short by the sad reality that our team did not make it into the final day of the tournament. On a positive note, it gave me an opportunity to plan another pen + ink load out. Apart from my must-bring Hobo and TN, I wanted to bring whatever pens and paper I could fit inside a larger case. The case I had in mind was the A5 sized Lihit Lab Teffa Bag in Bag. 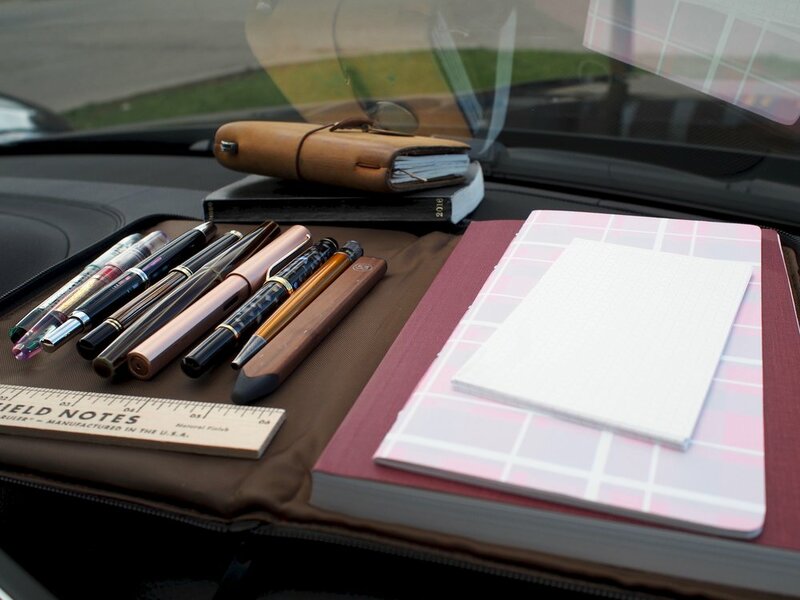 I was expecting to travel a lot from rink to rink and I wanted a self-contained writing tool kit that I could bring along. Lamy Lx Case After posting my review of the Lamy Lx I received some questions about the case so I brought it along to test. Lihit Lab Teffa Bag in Bag Contains my “writing kit”. Franklin-Christoph Pen Sleeve To carry a couple of “special pens" that I didn’t want knocking around in the Lihit Lab case. Hobonichi Techo As usual, I took this along for that beautiful Tomoe River paper and for writing my mantras of the day and gratitudes. Travellers Notebook Passport As always, this TN comes along for the trip. This time I did my usual 3 notebook set-up. I also used the Essential Leather zipper case / card holder from Baum-Kuchen. This minimalist case is perfect to carry a few cards and some cash on hand inside the TN. Most of the pens that came along had to fit in the outside pocket of the Lihit Bag with the flap down. The FC M45 fit in the Lihit outer pocket. No surprise, the FC Pocket 66 fits in the Lihit outer pocket. Look at this! How could I leave it behind? I decided to carry this in the FC pouch and popped it into my camera bag. It fit nicely in the Lihit case, plus, I wanted to work on the pen review for this pen. I also didn’t want to part with the Nakaya so it also went into the FC pouch with the VP. As you can see, I don’t have a thing about my pens not touching. I figured that since I'm brought the Lamy Lx case then I might as well bring the pen. For working on Chinese Cacography. For signing hockey score sheets. For playing on my iPad. This is 480 pages of Tomoe River paper bliss. I love the cross grid ruling on the paper. I started to use it exclusively for Pendora’s Box related things. I’ve recently started handwriting the initial drafts of the blog posts in this notebook. Curnow Backpack Journal I've been using this Tomoe River edition notebook in the Regular Sized TN that I use for weekend journaling. I couldn't fit the TN in the Lihit case but it was no problem to take the insert out of the TN and stash it into the Lihit for the weekend. For quick notes and nightly love notes to my son. I’ve finally decided what to carry to the Scriptus pen show tomorrow. I wanted to bring a backpack but not a huge one so I dug up this little pack from my closet and dressed it up with some pen-related pins to show my pen pride. When I posted my October pen + ink line-up, I mentioned that there were only 8 pens rather than my preferred 9 pens as a I was holding a spot for a new pen in transit. After an eventful journey from Eastern US with a side trip to Canada Customs, the pen has finally arrived. One week after returning from my trip to Philly, I was off to Canada’s capital, Ottawa, for a conference. I barely unpacked but gave some thought to my pen and stationery carry for this 2 day trip. Once again, I dipped into my September pen & ink line-up for this outing. This is what I brought. October 25, 2016 /Kate W.